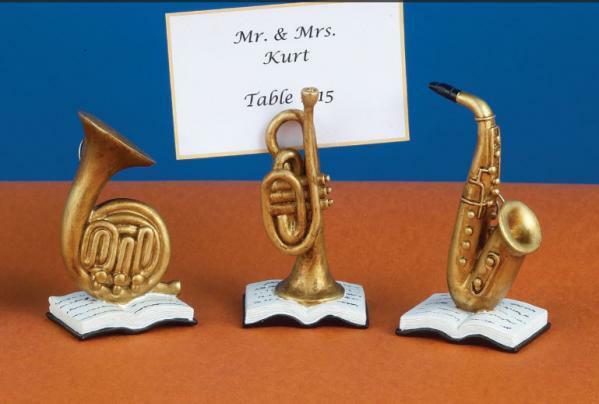 For music lovers, Diva Entertains bring you these beautiful detailed jazz instrument place card holders. Sold and priced individually, your entire order will be split (equally) among the 3 instruments shown (example: a quantity of 3 would buy you one of each). Hand painted with a brass look, they'll lead your guests in fine musical form to their seats. Instruments measure approximately 3" tall by 1 1/2" wide, and have a solid feel and weight to them. Guest will love taking them home to use as a photo holder. Please allow up to 5 business days to fulfill your order; then add ship time from NY.A top seller for Diva Entertains, our motorcycle place cards holders are beyond terrific!